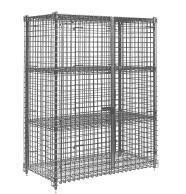 Description Wire Security Carts and Cages safely store and transport costly items that are subject to pilferage. The sides and doors are 2" x 2" wire grid. Units come with bottom shelf and top. All parts are Chrome Finish and Shipped Knocked Down.